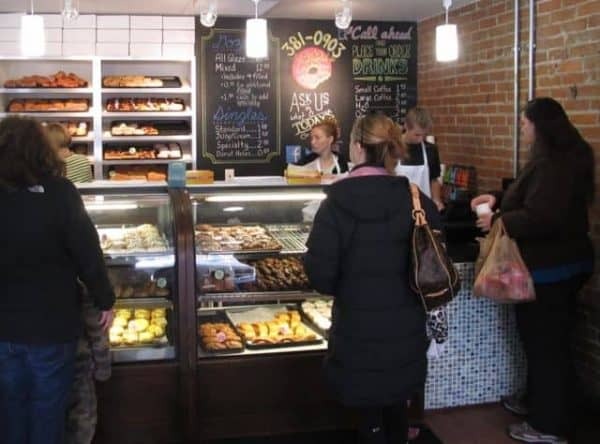 Here we are with another installment of 365 Things to do in Cincinnati and today we are featuring a sweet little stop – Holtman’s Donut Shop in Over the Rhine. We love to go downtown and we do tend to spend a lot of time in Over the Rhine so when someone told me that there was a new donut shop in OTR, I knew we’d have to check it out. With the German architecture on the outside and a full kitchen that’s visible from the street and the shop, I think you’ll agree that they should win the award for “most charming bakery”! Their donuts and pastries are all made fresh every single day and they’re made right there on site. Love!!! They had a great selection – racks on the back wall and a full case too. I’ve been hearing all kinds of chatter about a special donut they serve up at Holtman’s Donuts in OTR – a maple glazed donut topped with bacon! While that may seem kind of odd on paper, anyone who loves bacon knows you can’t just limit it to taking the sidelines with eggs! We ventured in to try to snag a few bacon topped lovelies but they were out of them by the time we arrived. In their defense, it was kind of late on a Saturday morning and they were BUSY (which I loved to see)! 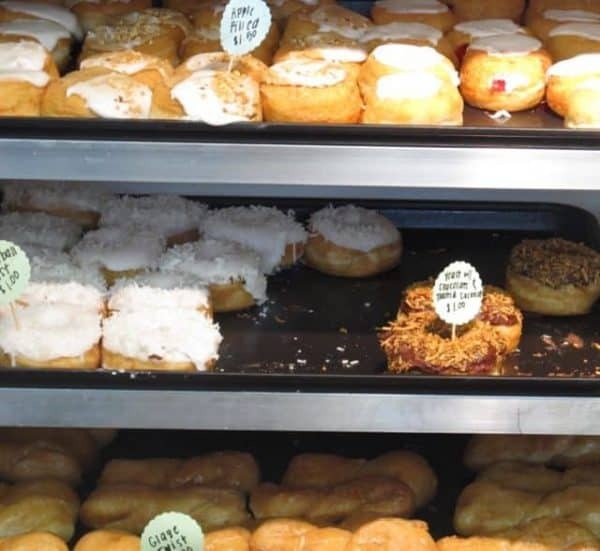 Holtman’s Donuts has a small but mighty little spot on Vine Street. They’ve made amazingly good use of their space which includes the donut cases and counter, a large table and chairs, and a coffee station. But my favorite part was the other “half” of the shop – the bakery. Windows separate the bakery from the donut shop. Kids (of all ages) were lined up at the window to watch as people iced and shaped and baked. It’s fun to be able to see the behind the scenes action of donut making. 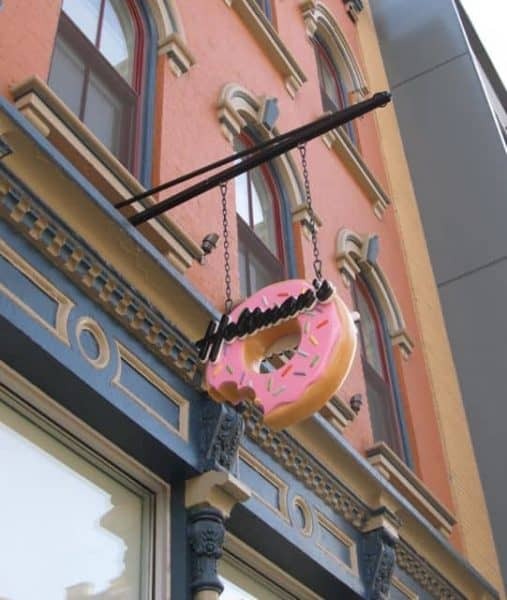 Holtman’s Donuts may be new to Over the Rhine but they’re not new to Cincinnati. A family owned business, Holtman’s Donuts has been around since 1960 and they have shops in Williamsburg and Loveland too. I have living in Cinti over 58 years and never herd of your donut shop until reading about it on facebook. I LOVE Holtman’s. The donuts are fresh and delicious, the shop is clean and bright, and the people behind the counter remember faces– a plus! I love introducing people to their maple bacon donuts; the reactions are always priceless!